KOLKATA: The long struggle for Darjeeling tea growers to protect its 'sanctity' is finally over. Only those that are 100% Darjeeling tea can be mentioned as such all over the world. If there is any blend, it has to be mentioned on the packet. "The German Tea Association agreed in a recent meeting that any packet labeled as Darjeeling Tea will have 100% Darjeeling tea. If there is any blend, it will be specified on the packet. This will definitely help generate more demand for Darjeeling tea in the European market," S S Bagaria, chairman of Darjeeling Tea Association, told TOI. Darjeeling Tea received the coveted Geographical Indications (GI) status in May 2011 under the European Commission Regulation. Earlier, in Germany any blended tea with 51% Darjeeling tea was considered Darjeeling tea. The remainder would be made up of any kind of tea, affecting the actual taste and flavor of Darjeeling tea. The niche Darjeeling tea is now among the seven non-EU products receiving the protected status. Darjeeling tea is the first Indian product to get the GI tag, which allows non-European products to be registered in EU countries. GI is a name or sign used on certain products, which corresponds to a specific geographical location or origin. "With this recent decision, we expect Darjeeling tea export to Europe to go up by 25%," Bagaria said. The total production of Darjeeling tea last year was 8.5 million kg, of which 3.5 million kg was exported, Bagaria said. More than 70% of the export - some 2.5 million kg - went to Europe with the rest going to Japan and the US. The price of premium Darjeeling tea now hovers around Rs 800-Rs 1,000 per kg. The medium grade costs around Rs 500-600 per kg and the lower end around Rs 400-500 per kg. Bagaria does not expect any rise in production because the weather was not favourable. Tea Board chairman MGVK Bhanu, Ambootia group owner Sanjay Bansal, Chamong Tee chairman Ashok Lohia, and DTA secretary Kaushik Basu were among those that attended the Germany meeting. Industry stakeholders said they had approached the EU authority in November 12, 2007 to grant this status. It took them four years to get it. There are around 87 tea gardens in Darjeeling now. Darjeeling is considered to be the best flavoured tea in the world. 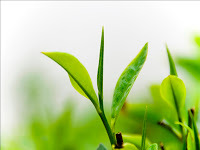 The first flush Darjeeling tea fetches the maximum price and it is predominantly exported.